OSHA Compliance & Regulation Manuals and Training Videos From Quality America Inc. Basic OSHA Compliance Program Our most popular product contains everything necessary for OSHA compliance in ambulatory medical settings. Save $127 with this purchase! OSHA Safety Program Manual w/ UpdatesAll the feature of our Safety Program Manual now with OSHA Watch newsletter updates. Dental OSHA Safety Program Manual w/ UpdatesAll the feature of our Safety Program Manual now with OSHA Watch newsletter updates. OSHA Watch Newsletter Back Issues Have you missed any issues of OSHA Watch? Check out our list of back issues for sale at $4.99 each, plus $3.95 shipping and handling or $3.99 for an electronic file (pdf). 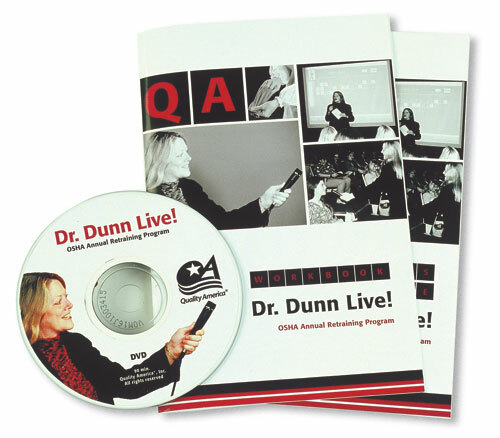 Dr. Dunn Live! OSHA Retraining DVD Learning System Need help retraining your staff on OSHA's Bloodborne Pathogens, Hazard Communication and TB precautions? Online Training Center Another option for OSHA Annual training and retraining.... Employees simply visit the online site where they can complete each self-paced course (about an hour) from OSHA Annual Retraining to Fire Safety. OTC courses are cost effective; based on the number of employees taking them. The HELP BookA Healthcare Emergency and Lifesaving Plan presenting emergency and safety procedures to your staff in a concise, yet informative manner. "Point of No Return" Sharps Injury Reduction Video ProgramOSHA's amended Bloodborne Pathogens standard put medical facilities across the country in a frenzy about how to come into compliance. "How To Be More Involved In Your Healthcare" OSHA PosterOSHA compliance and regulations poster from Quality America. Audio Conference Series Get an immediate response from nationally recognized OSHA expert, Dr. Sheila Dunn. Infection Protection Station Comply with CDC guidelines* for flu & TB prevention with Quality America's NEW Infection Protection Station. CLIA Compliance Procedure Manuals for Beckman Coulter Hematology Instruments Includes all items needed for CLIA compliance including forms, policies, specimen collection protocol, quality assurance program, NCCLS-formatted procedure manual and MSDS sheets. CLIA Compliance Manual for Alfa Wassermann's ACE Alera Clinical Chemistry System Includes all items needed for CLIA compliance including forms, policies, specimen collection protocol, quality assurance program, NCCLS-formatted procedure manual and MSDS sheets. 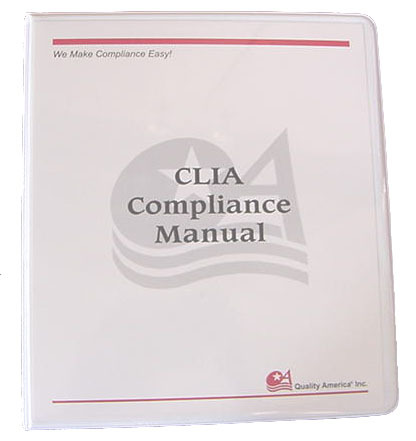 Compliance Without Complications (CWC) Procedure Manuals For Beckman Coulter Hematology InstrumentsIncludes all items needed for CLIA compliance including forms, policies, specimen collection protocol, quality assurance program, NCCLS-formatted procedure manual and MSDS sheets.